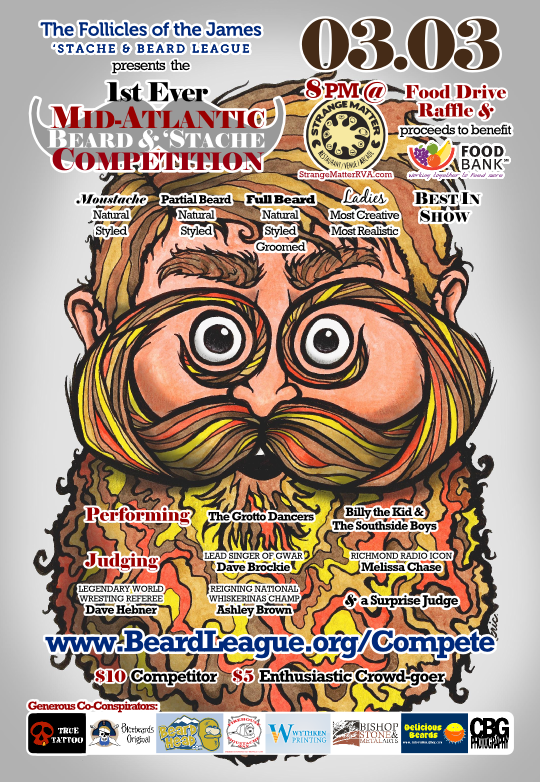 ou to join us April 30th at the Canal Club in Richmond for the Mid-Atlantic Beard & ‘Stache Championships 5! This year the proceeds will go to the Richmond Fisher House, which provides lodging to the families of veterans receiving treatment at the McGuire VA Hospital, at no cost. Tickets are $15 in advance and $20 at the door, with no extra fee to compete in any of our 14 categories. Doors open & on-site registration starts at 4 PM, and the Championships starts at 6 PM! Category 1100: Full Beard Natural Under 2"
Category 1200: Full Beard 2-6"
Category 1300: Full Beard 6-12"
Category 1400: Full Beard >12"
The McGuire Veterans Affairs Medical Center in Richmond is major VA facility for patients with polytrauma and spinal cord injuries, and the Richmond Fisher House, directly across from the hospital helps to ease the hardships of families of veterans injured in combat. The Richmond Fisher House contains 21 family suites, including private baths, dining, recreation, and entertainment areas, and is fully handicap-accessible. Its average occupancy level is 92-94%, with an average length of stay around 2 weeks. Guest stays have extended as long as one year. Since opening in 2008, over 4,500 families have been their guests. Having family members nearby provides significant benefits and advantages to patient treatment, rehabilitation and recovery. By providing cost-free living quarters for patient families, the Richmond Fisher House provides an immeasurable benefit to patient care, in addition to the care and well-being of our veterans’ family members.